In an interview from 2014, the American novelist Jumpa Lahiri is quoted as saying: “Language, identity, place, home: these are all of a piece—just different elements of belonging and not-belonging.” The feeling of belonging contained in these particular facets of experience is integral to our lives. It constitutes our basic sense of being connected to others and to ourselves; without this sense of belonging we have no peace. 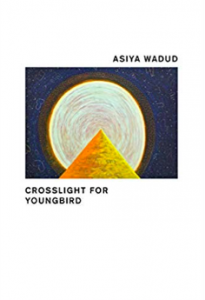 In Crosslight for Youngbird, Asiya Wadud’s deep and affecting debut collection of poems, the lack of peace that comes from “not-belonging” is pervasive, along with the atrocities that both create it and accompany it. The book comprises two sections, the first one “northern wheatear see water” addresses the European refugee crisis, the second “salt carrion constellation” speaks to similar themes—those of displacement, unmoored life and loss—but pulls us closer to the writer’s own life and immediate experiences. Wadud, a poet as well as an English teacher who works with immigrants, has a personal stake in and a unique awareness of the subjects she explores in this collection. Wadud’s poems are risk-taking and experimental, many are prose poems; a few are accompanied by photographs of the ocean, highlighting the recurring images of salt, water and travel that punctuate the book. The rhythmic, propulsive voice of the poems seems to drive a wedge of language into the mind as if trying to open the reader up to the difficulty of their subject matter, as the poems speak to the lives and struggles of refugees, many of whom die terrible deaths while fleeing their home countries in search of safer locations. In “Lida meet lorry (after Parndorf),” for example, Wadud describes the death by asphyxiation of seventy-one refugees in the back of a sealed truck. Her words probe and prod at the story, never quite getting an answer as to why this tragedy occurred, why God allowed this to happen, how the driver could have been so heedless. She presents snapshots: the “capacious atria” of the refugees, the ripe, walnut-sized heart of an infant who died among them. Through her keen, empathetic imagination, she renders the parents of the migrants, “Some mother gripped the yolk sack between her teeth. Some father held the baby just the length of his musculature.” She sifts through the shards of this tragedy, attempting to gather the shattered lives of the victims and assemble them into something the reader might recognize. Midway through this first section we find a poem entitled “Youngbird, highwaterhome,” a piece in which Wadud addresses a different kind of dislocation, that of being mistaken for a foreigner in her own country. In response to this misunderstanding, she describes how she wrote, at the age of nine, letters to girls across the country—“when a country doesn’t claim you, just gather your own,” she asserts. Forced to reconcile the disparity between the identity she possesses for herself and the one she possesses for others, she finds strength in a hard-won self-knowledge. Yet, this reckoning with self and other, significant thought it may be, can never quite heal the rift. A feeling of estrangement persists. Little bear, you spent 77 days with your own black thoughts, chasing a scythe, a sickle, a sepulcher, a sentry. You spent all those days chasing your own slippery tail, fishing for carrion. The ache in this poem returns later on in “testament, a litany for many voices,” where Wadud considers God, enumerates his failures, ruminates, wants to believe in him but struggles to discover his kindness. Who is this God that takes the lives of migrants and infants? she seems to ask, and why do we continue to invoke and entreat him at every turn of hardship in our lives? There are many references to God throughout the book, speakers who ask for his grace, who thank him, passages that contain prayers to him, even an excerpt from Rilke’s “Widening Circles,” yet, these entreaties seem only to underscore his absence in this world of “not-belonging,” unmoored life, homelessness and death. The penetrating lyricism of this poem draws the reader away from the atrocities examined in the first section and into the realm of memory and desire, but remains in the same medium of salt and ocean looking towards the same God, reframed now as a blessing and a presence that fills the void. This is a compelling place to arrive at, honoring and acknowledging the wonder and heartbreak of being alive in a world fraught with love and violence. There is no escaping the preserving salt, the amniotic fluid, the ocean water, and the treacherousness of traveling through these mediums, but travel we must, nonetheless. Drinking deeply from this sea may provide nourishment; traveling through it may deliver, (some, not all) to a home. We all have a need to belong, whether to a country, a society, a family or a home, for these are the things that grant us sanity. In this era of increasing technology and decreasing connection, increasing news updates and decreasing physical interaction, it’s important to be able to remember who we are and who it is we really belong to, which is one another. Wadud’s book, as it speaks to the horrors of diaspora, colonialism and the absence of God, attempts to restore humanity and soul to those individuals we may quickly pass over in the frenetic stream of our twenty-four-hour news cycle. It is important to slow down, to look deeply and searchingly at the problems we create for one another through our own negligence. If we are all adrift, lost, “bobbing creatures amniotic salted on this island of deserted windmills,” as Wadud says; perhaps it is through the acknowledgement of each other’s hardships that we can become mooring lines for one another; perhaps it is through the kind of writing and thinking that Wadud peruses in this collection that we might begin to fill in the many spaces where God seems to have gone missing. Dara Elerath received her MFA in poetry from the Institute of American Indian Arts. Her poems have appeared in journals such as The American Poetry Review, AGNI Magazine and Poet Lore, among others. She was the winner of the Francis Ponge Poetry Prize in 2018. She lives, writes and designs in Albuquerque, New Mexico.